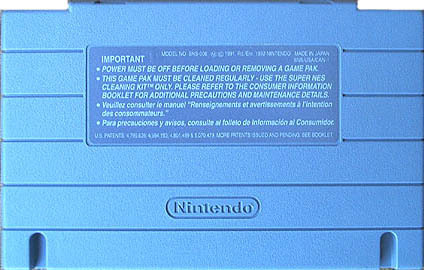 This Super Nintendo cartridge was used to promote StarFox. This game was the first game to use the FX Chip to create new 3D effects on the Super Nintendo. Nintendo held a competition on the last weekend of April in 1993. It started Friday April 30th and ended Sunday May 2nd. Every player received a free StarFox pin for playing. If you received more then 70,000 points you got a free t-shirt. The top score in each location won a StarFox Jacket. Also the top winner of each location was entered into a drawing to win a free trip. One winner was selected to win the trip at random for all the winners of each location. There were approximately 2000 locations across the United States that the competition was held. I went to the one at Saturday Matinee in Carousel Mall in Syracuse, New York. One other store in the mall was also holding the competition so I went back and forth between the two stores. I got 2nd place in this competition. 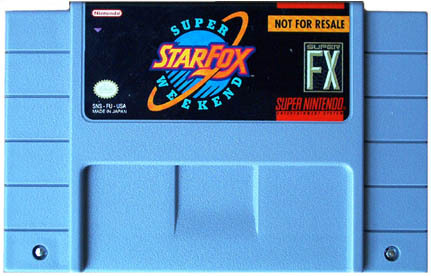 A while after the competition was over Nintendo sold the StarFox Super Weekend cartridge for $45 through the Super Power Supplies Catalog that came with Nintendo Power magazine. This game is just the cartridge. Nintendo never made a box or instructions for this version of the game.